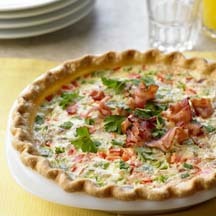 Flavorful and easy to put together, this tart works well for a brunch buffet or light supper. Place pie shell in pie plate. In bottom of pie shell evenly scatter the crumbled bacon and chopped peppers. In medium bowl, beat together the cheese, eggs, milk, seasonings and onion. Pour over bacon and peppers in pie shell. Bake in a 325°F (160°C) oven for about an hour, until set ( a knife inserted into custard halfway between center and crust will come out clean) and lightly browned on top. Nutritional Information Per Serving (1/8 of recipe): Calories 230 calories, Protein 9 grams, Fat 15 grams, Sodium 530 milligrams, Cholesterol 90 milligrams, Saturated Fat 4 grams, Carbohydrates 17 grams, Fiber 0 grams. Recipe and photograph courtesy of National Pork Board.